Do you need your documents certified and legalized for Egypt? 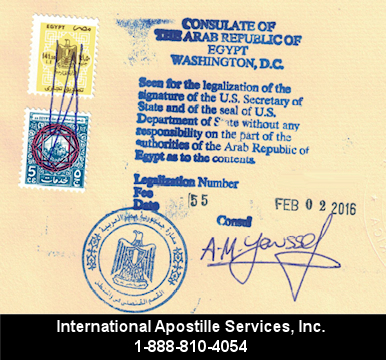 Certifying and legalizing documents for Egypt is a two or three step process. Documents which fall onto the Egyptian Consulate office only requires two steps. Documents which fall onto the Egyptian Embassy requires three steps. 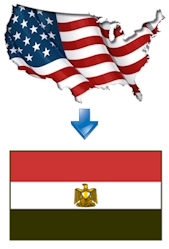 The country of Egypt has one Embassy in Washington, D.C. and four Consulate offices (California, Illinois, Texas, and New York). The Embassy and Consulate offices have State specific jurisdictions. Another words, a California document can only be certified and legalized through the Egyptian Consulate in Los Angeles. Please Note: We can only help you with documents originating from the United States. If your documents originated from Egypt, you will need to contact the correct competent authority to assist you in that country.